You can pay via Credit Card. 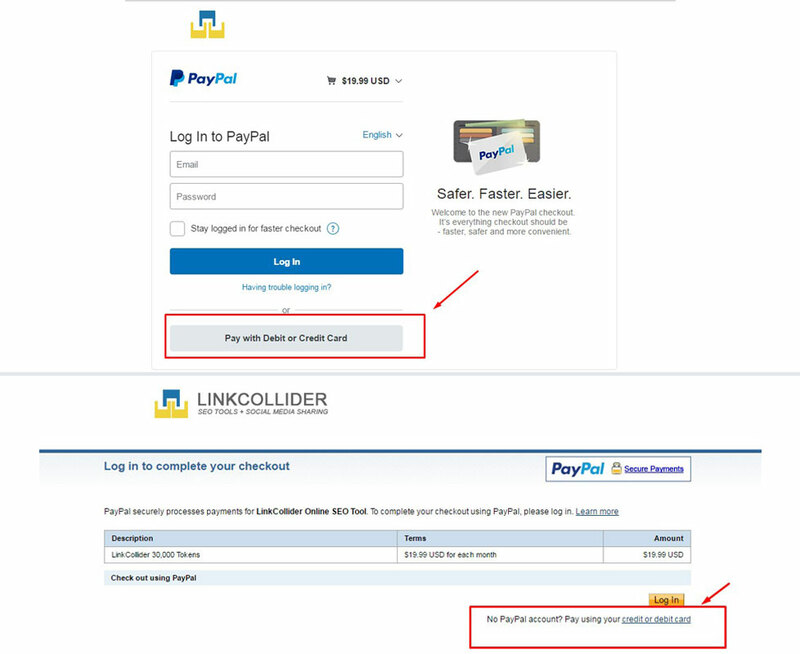 Simply click "Pay with my credit or debit card" on the PayPal purchase page. See screenshots below. Token serves as your money on LinkCollider. You will pay tokens to the other users of LinkCollider to give you tweets, likes, shares, blog posts, followers, website traffic, and subscribers. No problem! You can pay via Credit Card. Simply click Pay with my credit or debit card on the PayPal purchase page. Both the Client and LinkCollider have the right to terminate any Services Agreement for any reason. Refunds shall be refunded on a pro-rated basis. Any other request for refund will be reviewed and granted on a case-by-case basis. You could always cancel your subscription at anytime via Paypal setting. Click here for more instruction. You could also email us the Invoice Number of the item you want to suspend.